The Right Rev. 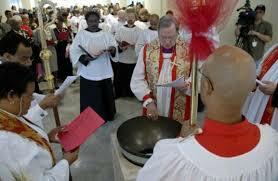 Don Wimberly, Bishop of Texas, blesses the baptismal font at the dedication of the new St. James' Church on April 1, 2007. St. James' Episcopal Church was established in 1937 during the administration of Bishop Clinton Quin, with the Rev. Thomas Clarkson serving as Priest-in-Charge, followed one year later by the Rev. Thomas Bagby. Under his leadership, St. James’ experienced phenomenal growth. In 1940, a new church was erected. In 1941, the church achieved parish status, with the Rev. Thomas Bagby as its first Rector, a position he held until 1952, when he was called to a then new parish, St. Martin’s. Thomas Bagby was succeeded as Rector by the Rev. Robert L. Johnson. Under his very capable leadership, St. James’ became one of the largest parishes in the Diocese. The physical plant was expanded to include classrooms, a library, and a parish hall. During the most crucial period in the history of St. James’, the Rev. Keith Bardin was the Rector. He came at a time of demographic change in the Riverside/Third Ward area. African-American families began moving into the neighborhood as white families moved to the new suburban areas. Membership at St. James’ dropped significantly. Keith Bardin provided courageous leadership to those families who stayed and were committed to this church and its ministry. With the encouragement of some of the remaining parishioners, the Rector set about integrating the congregation. At the invitation of the Rector, Joan Bookman, a recent graduate of Howard University became the first African-American member of St. James’ in September 1959. By the end of that year, ten other African-Americans had transferred to St. James’. When Keith Bardin left in 1962, the integration pattern was well established, and African-Americans became an integral part of the church. The year 2009 marks the 50th anniversary of the integration of St. James’ Church. Since the departure of Keith Bardin, St. James’ has had six interim and four permanent rectors. Each of the latter four made significant contributions to the growth of the church. During the administration of the Rev. John Sanders, with the assistance of fellow priests Penrose Hirst, John Worrell and Albert Ettling, a ministry with local universities--Rice, Texas Southern and the University of Houston--was established. A number of persons from these schools became members of St. James’. When John Sanders left as Rector in 1970, the Rev. James L. Tucker became the church's fifth Rector, a position which he held for 22 years. During his administration, the physical plant was greatly improved – the sanctuary was enlarged and a new parish hall replaced the one demolished by fire. Under Father Tucker’s leadership, St. James School was founded in 1971 and housed in two new buildings, Tucker Hall and Rayzor Hall as part of the outreach program to provide education within a nurturing Christian environment. During this time, the parish family grew, the social mission of the church was advanced, and the parish’s commitment to outreach to the underserved was sustained. The tenure of the Rev. Antoine Campbell extended from 1994 to 1999. The outreach of the church is among the most enduring legacies of his time here. The Jubilee Ministry that serves the homeless, indigent and those in transition within our community was established. This ministry offers a worship service and a hot meal prepared by the laity of the church. The Contemporary Jazz Service, a worship opportunity to attract young families and college students to St. James’ was re-introduced; and the St. James’ Keepers, which establishes social contact with members who live alone began. In August 2000, the Rev. Irving Cutter, IV was called as the seventh Rector and served until 2006. Father Cutter spearheaded a re-examination of the mission of the church and the establishment of the Core Values Councils. In November 2003, the main sanctuary was destroyed by a tornado. After a period of mourning and readjustment, Father Cutter organized the Building Committee and a capital fund drive to begin the process of rebuilding the sanctuary and to realize the vision of the strategic plan for the entire St. James’ campus that would greatly enhance the utility and the beauty of the property. The "Steadfast Faith: Embracing the Future" Capital Campaign began as the vehicle for funding the new church. Hundreds of significant donations, from church members and many others in Houston and around the United States, were made to complete this project. The dedication of the new sanctuary was celebrated Palm Sunday, April 1, 2007, by the Right Reverend Don Wimberly, VIII Bishop of the Diocese of Texas. In July 2005 Deacon Roberta Knowles, a new seminary graduate, was assigned to St. James’ as Assistant Rector. She was ordained a priest in February 2006 and led St. James' after Father Cutter accepted a call to another church in September 2006 and in the absence of an interim rector for six months. The Rev. William DeForest and the Rev. Brian Porter served as interim rectors until the Reverend Victor J. Thomas answered the call to be the eighth Rector of St. James’ beginning January 2009. All of the above priests, the interim priests and assistants, along with dedicated and hardworking parishioners, have enabled St. James’ to remain a united church, determined to carry on its mission. We seek to build the Kingdom of God by bringing people to Christ and helping them to be Christ-like. Our core values of worship, pastoral care, Christian education, outreach, fellowship and diversity serve as the foundation for our dedication to the mission and vision of St. James’. We are confident that our 75 years of bearing witness to the Good News of Christ will continue to be strengthened and amplified. Thanks be to God.